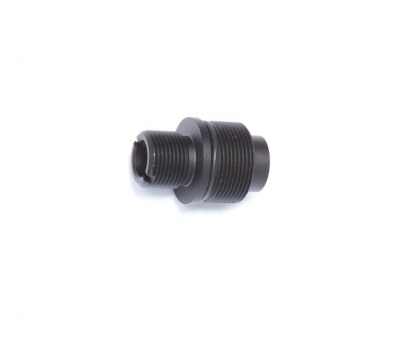 This 14mm threaded barrel adaptor is easily screwed into place at the muzzle of the M40A3 Airsoft sniper rifle (ref.nr 17993 and 50098) and allows the mounting of a barrel extension tube. The 14mm CCW threading fits most of the BET’s out there and used in combination with the front accessory rail (ref.nr. 18124) will help transform the M40A3 into a M40A5 version.